Enhance your cover with your logo or text foil stamped on the cover style of your choice. Easily Print Your Own Labels. Get Your Tabs Exactly the Way You Want Them. Welcome to MyBinding video. 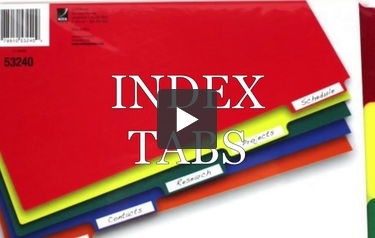 Even in our digital world, index tabs are prolific and used everywhere. When it comes to organization, index tabs help. At MyBinding.com, we strive to carry everything. Whether it’s numerically, alphabetically, subject matter, and even create your own, we have option after option by the best brands in the market. We also specialize in customization. We can punch anything you like and any way you’d like it. We have pocket pages, insertables both five- and eight-tab erasable items and plenty more. We specialize in options and the ability to create your own instantly. We have plenty of self-adhesive items and products that seem to just work for themselves, setting you up for success. Clicking around on our website, you’ll find index tabs and see all the options that we do have, even a section to help you find which index tab is right for you – copier tabs, pre-printed index tabs, customizable pocket and presentation or brand printing copier tabs. Of course, colors are plenty. We sell a good amount of poly materials for heavy-duty work as well as extra wide or non-standard sizing. Dividers and presentation covers are part of this world and we have a lot to choose from. So as you click around to find what you need, know that we’re always here on the phone too and we can help you find what you’re looking for. And if you know exactly what you need, you can shop by part number as well as by brand – Avery, Cardinal, Wilson, GBC, and plenty more. We strive to have everything in stock so it ships fast, whether it’s one item or a case. For more demos, reviews and how-tos, check out MyBinding.com.